Lancashire-based renewable energy business RenewWeCare, has received a £100,000 loan from NPIF – BFS & MSIF Microfinance, part of the Northern Powerhouse Investment Fund. ReneWeCare is a new and innovative family business which has developed the world’s first commercial solar module access system. The system allows safe access and zero pressure to the glass of various solar module arrays; a first for the renewable energy industry. Eric Couling, Director at RenewWeCare, has worked in the renewable energy sector for over 10 years and during this time experienced the issues and dangers in maintaining solar panels. Walking on the panels often led to damage and also injury to the operative, due to the slippery and inclined surfaces. With this in mind, Eric alongside his three sons – all whom share a passion for innovation – have spent the last two years on developing a solution. This led to the creation of a solar module access frame, which provides a safe working environment and applies minimal pressure to the glass of the solar panels. 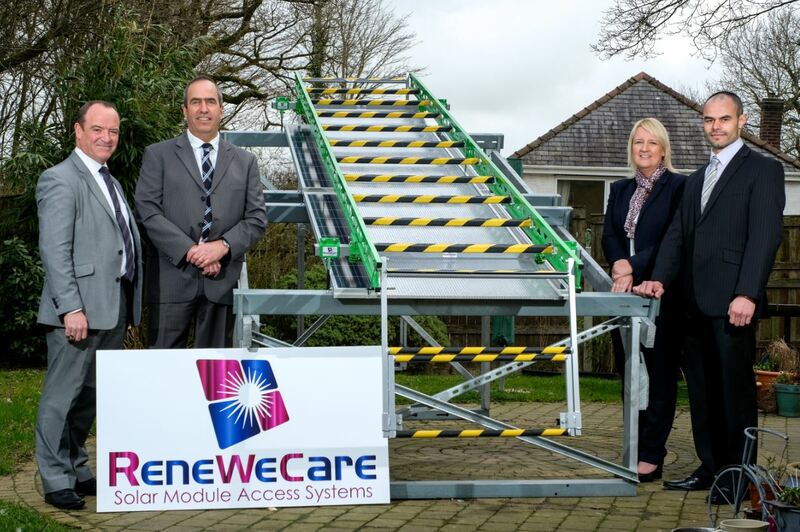 RenewWeCare’s solar module access frame minimises glass fractures, provides a much safer working environment and also allows solar panels to be replaced three times faster. The funding is being used for the initial product manufacturing and for marketing purposes. Eric Couling, RenewWeCare Director said: “The comments we have received from Health & Safety Managers to Area Managers and all the way up to Directors at various photovoltaic companies has been amazing. Comments include ‘changing the industry forever’ and ‘at last we have a safe system of work’. “We think we have a great solution but without MSIF we would not be in a position to make the solar industry a safer place and stop unnecessary damage being caused by O&M engineers being forced to walk on the glass modules.